An Off-Broadway success, this very funny, yet touching play focuses on the lives of four mentally-disabled men who live in a communal residence under the watchful eye of a sincere, but increasingly despairing, social worker. Filled with humor, the play is also marked by the compassion and understanding with which it peers into the half-lit world of its handicapped protagonists. The cast includes: Jameson Donaghy, Arnold Wiggins; Chris Donte’ Benson, Lucien P. Smith; Thomas Crowder, Norman Bulanski; Michael Koon, Barry Klemper; Charles Humphrey, Jack; Ethel Rodriguez, Sheila; Christopher Miller, Mr. Klemper; Joy Peterson, Mrs. Fremus, Mrs. Warren and Clara and Kenan Meadows, Mr. Hedges, Mr. Corbin and Senator Clarke. 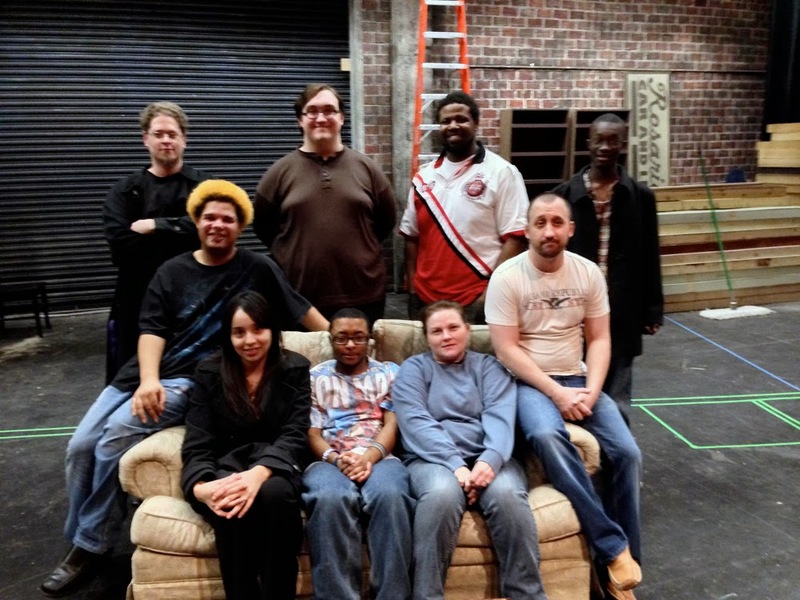 Directed by Charles Leader, “The Boys Next Door is at 7:30 p.m. March 6, 7 and 8 in the KCKCC Performing Arts Center, 7250 State Ave.. There is also a matinee performance at 2:30 p.m. March 9. Tickets are $10 for adults and $5 for students and senior citizens. The play is free to all KCKCC students, staff and faculty members with a valid ID. For more information on “The Boys Next Door” or to reserve tickets, call 913-288-7106. Sitting (left to right) - Ethel Rodriquez, Kenan Meadows, Joy Peterson.